Unpaid internships are drastically losing appeal as the tuition costs rise. At the same time the expectation for college students to have an above average resume filled with distinct credentials in order to even be considered for a professional position rises. This means that students are expected to handle balancing school with a secure job. That in itself can be put down on your resume. The fact is occupations that will make you stand out when you apply for a professional job come short and competition for the available jobs is at an all-time high. When it comes down to choosing a particular job it is all about looking for and understanding what criteria you can write in your resume that will make you stand out for the job you truly want. Instead of you having to think through the top job opportunities, below you will find the best jobs for college students, the average amount they make and a description of what they entail and how it can help you land any job you want. The easiest way to become successful in the career you want is to have as many people backing you up and connections as possible. By becoming a campus tour guide, not only do you develop communicative, speaking and people skills on the spot but you also build leadership qualities and connections with other college students. Generation Y and the following generations will only continue to be more technologically advanced. This means that the skills required to make as much as $38,000 while in college are directly connected with the amount of self-learning you do. With businesses relying heavily on their technological departments, having an IT or Lab Assistant is priority. There is no need for an IT person if there isn’t a constant development of internet branding. The use of social media is prevalent in nearly every company. By working as a Social Media Assistant/Consultant you develop brand marketing skills that any future employer will look up to. Highly looked down upon by people in search of a job, but a little known fact is that employers look to see if you have been a waiter or waitress before. This is likely because they worked as a waiter or waitress at one point in their lives and know that it builds incredible team building skills, multi-tasking abilities and an overall positive attitude that is needed to serve. The talents you build are greatly sought after by any employer you hope to work for. While you may think that the skills required to become a freelance writer are solely based on your knowledge base and ability to research topics to write about, it is much more than that. The lessons you acquire by becoming a freelance writer are the ability to comprehend short messages or prompts and configure them into a way that appeals to a distinct audience. You learn the structure of direct communication. The best part is that by becoming a freelance writer, you can become an expert of anything you want, but of course it would be better to focus on the career theme you hope to have after college. Becoming a bank teller sets you up with the credentials to handle even larger amounts of cash for companies as their financial advisors, accountants or consultants. In addition to personal money handling experience, you gain the insight into hundreds and even thousands of other money habits people have and you begin to discover what works and what doesn’t. Combine this with your major of economics, marketing or business and you are set. Companies can’t have social media and digital branding if they don’t have a logo or graphics to show off. The time, delicacy and quality necessary to become a successful artist/graphic designer is second to none when you are looking for a brand marketing career that allows you to use the artistic talents you already have. Every company’s success is instinctively based on the amount of sales they make. The one and best way to end up making as much money as the CEO is to excel at the bottom (sales) and work your way up. The perk to this is that your success is directly related to the amount of effort you put into closing the sale and negotiation abilities are highly sought after. If you thought a Waiter/Waitress had to have an extreme talent for multi-tasking, you haven’t tried becoming a Virtual/Personal Assistant yet. Although you may need to do a strenuous variety of tasks, you have the ability to become successful since “the little things” can add up to be one great talent that is searched for by every industry. Many major careers require exceptional organizational qualities which can be retrieved by becoming a library assistant. The time, patience and construction that go into this job are perfect since many bigger careers require a lot of insight and attention to detail. The highlight of being in a paid internship is often not the money you make, but the skills you require which are directed at the particular career you hope to take when you graduate. While you may be taking a monetary cut, you are gaining more of the skills necessary than any other job as long as you stay within the realm of your excepted career. This is becoming more of a trend for college students since the amount of knowledge that can be found on the internet is at the greatest amount ever and is only growing larger. The income that can be made from the jobs and opportunities available for self-employment are linked to the effort you put in. While you may need to put more hours in than any other job listed, you can also get twice as much income. Instead of waiting until after college to begin living your muse, you can start now. Have a job that you think should be on our list of top jobs for college students? Leave us a comment. The latter is often where the real gems are since fewer people know about them. 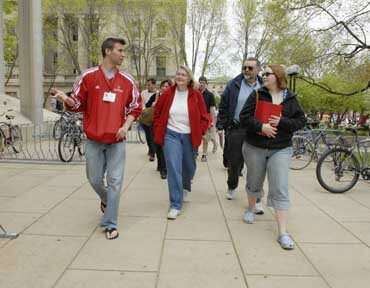 Read on to learn how to find scholarships for college students.. Previous post: Should You Rollover Your 401K?